As early as 1966, Neri & Bonacini began development of their very own car. Before this, the pair had rebodied a number of Ferrari chassis, producing the notorious Breadvan and gorgeous Nembo Spyders, but the Studio GT was an all-new design. To Neri & Bonacini, it was the ideal Italian sports car, having small proportions, a mid-mounted lightweight engine and stylish aluminum body. Called the Studio GT Due Litri, Neri & Bonacini began their project by constructing a sheel-metal tub with a complex lattice-steel structure to support the outer body. Front and rear square tube subframes supported a custom suspension with specially cast uprights. The engine bay had enough room for several different engines. The initial idea was to use the power plant from the Flavia V4, but production was ending so several others were tested. These included the Taunus V4 as well as a potent ATS V8. A plaster body buck was created that formed the shape for many prototypes to follow. The overall lines of the car had sweeping curves and they were not too far from the which was released in the same year. The first Studio was finished and used for several test configurations. Before the second car was completed, Neri & Bonacini ended their partnership to pursue different ventures. 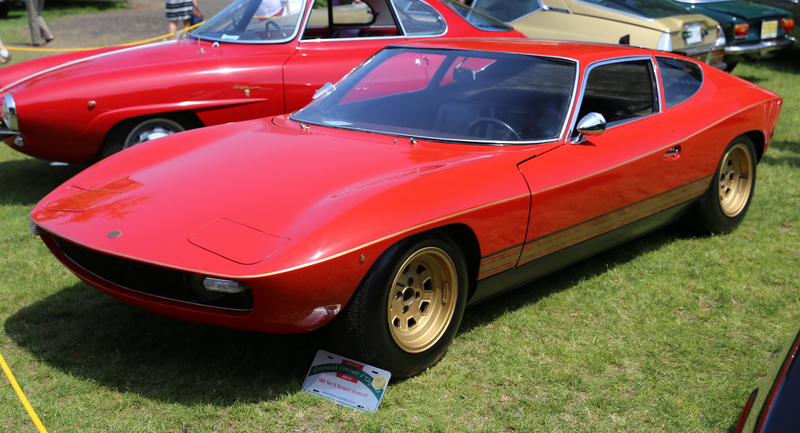 Giorgio Neri went to DeTomaso where he completed the second Studio GT prototype. The second car was different from the first, featuring electric pop-up headlights, a fully trimmed interior with adequate sound deadening and full bank of instrumentation. The car was used to test several engines, but ended up with the Lancia Flavia V4 which was the original plan for the car. Both the first two cars survive and remarkably the second car is currently in untouched, original condition. It was purchased by John Mastroianni Sr. of Auto Turismo & Sport Ltd. in New York without windows. It has since been refurbished, but not restored. It was displayed in this condition at the 2001 and 2009 Greenwich Concours d’Elegance. Coltrin, Peter.”Studio GT Due Litri”. Road & Track. October 1968.